I had the weekend off around my April birthday. 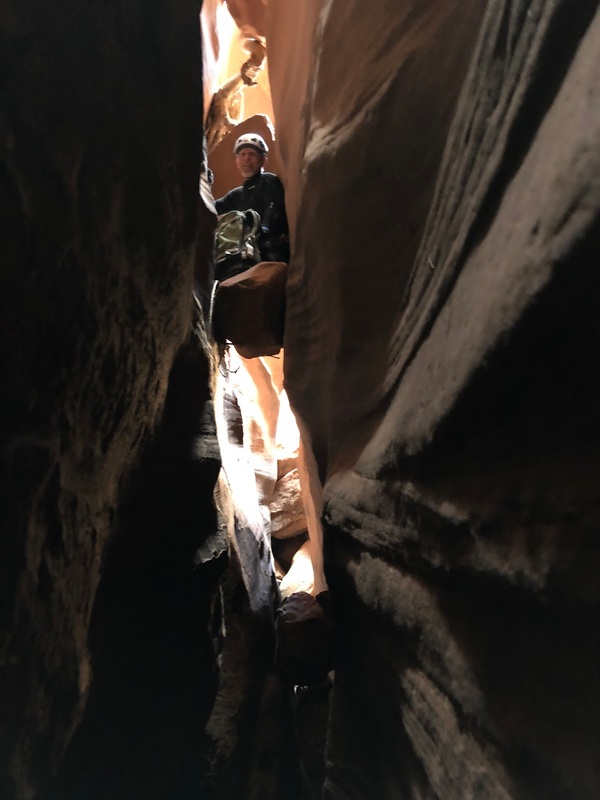 Deb agreed to watch Sheri's kids for the weekend, so I contacted a friend and arranged to go canyoneering in the Lake Powell area. Ideas were shared and plans were made. We pulled my boat over to the Bullfrog Marina on the northeast end of Powell and launched with 6 persons and full packs. The weather started out rather chilly but with full sunshine. Our course took us up the Halls Creek arm of the lake where I beached my boat and tied it off with 4 lines. 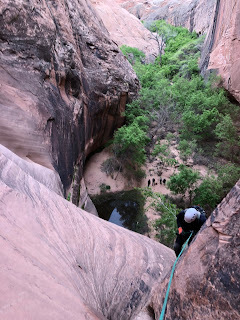 Then the next 3 1/2 hours we carried very heavy packs over slickrock and through willows and tamarisks and deep sand. Once our camp site was chosen we dropped our overnight gear and immediately headed for our first canyon. 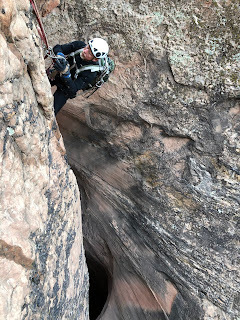 Soon we were "gearing up" and rappelling into Happy Dog Canyon. The canyons in this area are known for deep tight slots and large round potholes. Soon I knew why Kip instructed me to bring knee and elbow pads. Strenuous chimney moves and stemming were required. 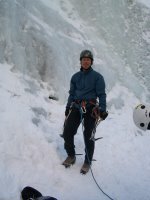 Rappelling off of sandbag anchors and using potshot rope tosses and assisted down climbing was the style. 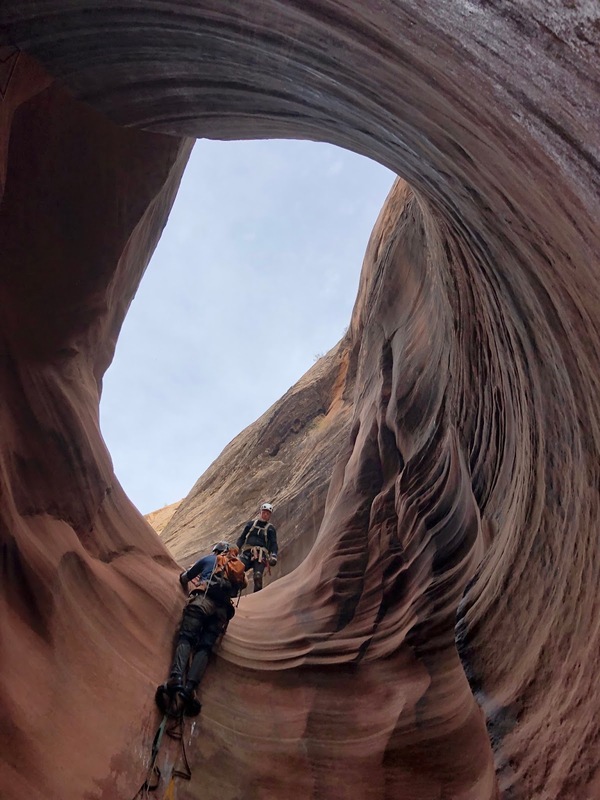 This style of canyoneering is called "ghosting". Interesting and appealing, but it does add an element of risk. We emerged from the canyon just before dark and made dinner around a campfire already physically fatigued after our first day. The second day we got up at first light and quickly loaded up for a long day. This was the day to do Poe Canyon. It had a reputation as being a very difficult and challenging canyon. We were all excited. 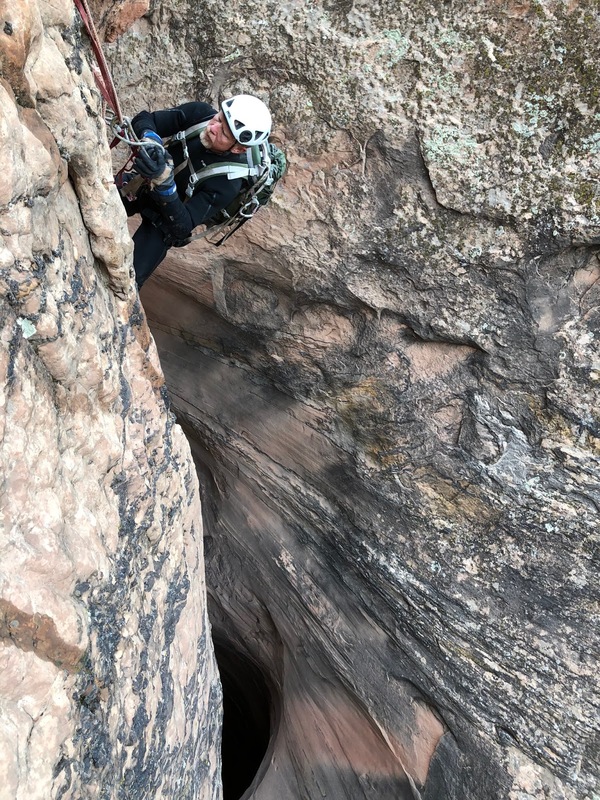 Guy was the only member of our team that had been down the canyon. It was a great canyon and did require teamwork as we ghosted through the many potholes and drops. We did have great difficulty getting over and around the Pit of Despair. A large deep mostly dry pothole. Multiple attempts to throw potshot lines over it were futile. Finally Mark our lightest and nimblest member was able to rock climb over and up and pendulum onto the other side. Almost 3 hours at this one spot! Whew!. Again we arrived back to camp at dusk. This time I was really physically spent. The campfire time was enjoyable and the desert night sky was brilliant. The next day we had plans to do a third canyon, but all of us had had enough and we knew we still had a long hike out and a ride in my boat to the marina followed by a long drive home. I was glad we decided to backpack out in the morning as we found the lake to be windy and the waves already growing in height. It was my 57th birthday. The best part of the day was when I arrived home to find my daughters and most of my grandkids waiting for me with presents and cake. An awesome welcome home!